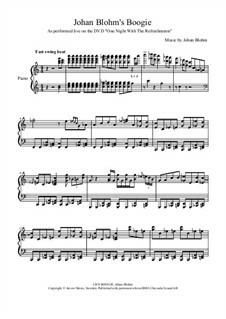 This is the sheet music for Johan Blohm's Boogie, transcribed from his live perfermance on the DVD "One Night With The Refreshments". Please support the creation of more arrangements like these, and don't share or distribute this sheet music. Please leave a comment or send me an e-mail if you have any questions. Thank you very much for that, Amy! Your performance of the piece really is brilliant!